Vine … it’s all about cats right? One of the great things about a new job is meeting loads of new people and having some really great introduction conversations. In my case of course the conversation invariably, at some point, turns to my digital expertise. I have always been wary to call myself a digital expert – it is such a huge field and it is constantly evolving so it is very hard to be a genuine expert in this field. There are also so many new apps and “shiny toys” that I myself have not personally used and again I find it slightly false to be talking about something if you have no experience in using it yourself. It is precisely because of this that I decided to have a go at using Vine. I have heard so much about it but have had remarkably limited exposure to it. I had asked myself a number of questions around its use, such as what the point of it was and whether it is a social media channel or an app? I presumed it would be just like the other apps – and I was not sure I would think much of it. The result however is that I have had an evening of fun trying to catch snippets of my cats doing silly things! 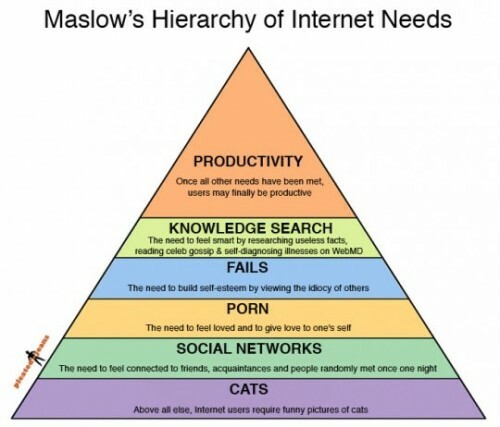 Awesome fun – and as we know cats are the foundation of Maslow’s internet hierachy of needs so purfect! And then once I started sharing these snippets of Don and Ninja (my cats) on Don’s Facebook page (yes my cat has a Facebook page) and the comments started streaming in, it all fell into place for me. Vine was clearly made for cat videos and therefore is an integral part of social media! On a more serious note though one thing that Vine very nicely demonstrates is the ease with which individuals can create their own content, without specific skills, and using a simple app and a smart phone. Apps like Vine and Instagram have given each and every one of us the power to create dyanmic audiovisual content which we can share. This is a great power but it is also a great opportunity for budget strapped companies. People like to create their own content and they like to share. Companies always need more content. This seems like a match made in heaven. In theory it should be, and each year, as more and more apps like Vine and Instagram are introduced, this opportunity will grow. The reality is however that many companies who are starting to dabble in social media are not only scared of allowing customers to provide their own content but also thoroughly underestimate the amount of content they will need. This double whammy results in few companies seriously looking into, and planning for, customer content creation. Some companies have dabbled in this with the odd Pinterest board, but very few have fully embraced customer participation and contribution as an integral part of their social media strategy. Will this change? I think it will have to. Budgets will remain tight so seeking out new content sources will only grow in importance. Meanwhile the opportunity to engage with customers and get them to contribute to content will grow and it will become more and more obvious that this is an opportunity that companies need to seize with both hands. Does this mean that pharma companies social media initiatives will suddenly become full of Vine videos of cats? Probably not! But it does mean that if pharma companies take on board the gift that apps like Vine and Instagram are offereing they will make better use of their budgets, start having social media initiatives with sufficient new content, and be a step closer to building those much touted online relationships. Posted on Sep 5, 2013, in Facebook, Social Media, Strategy. Bookmark the permalink. Leave a comment.